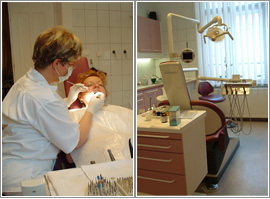 The double-chair surgery is in the city of Miskolc. The dental units are real new, the surgery is light and well-equipped, digital X-ray,panorama X-ray, intraoral camera are helping the curing There is a little oral-higienic shop where you can buy anything to take care your teeth and gum , giving advices is free. The waiting room is big and elegant.